Ford has filed a trademark application for ‘Ranger Thunder’ in Europe, potentially signaling the arrival of a new special edition version of the midsize truck in certain markets. 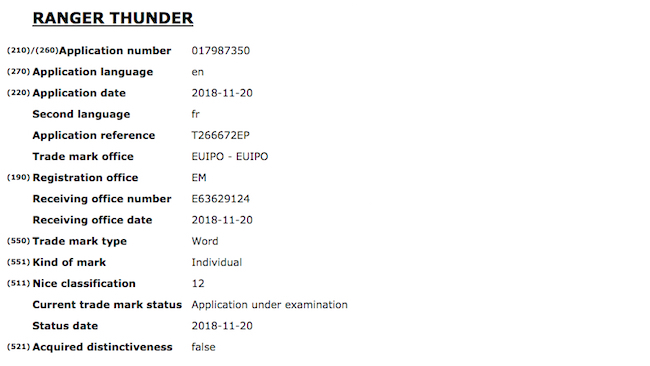 The trademark application was filed with European Intellection Property Organization on November 20th, 2018 and was dug up through the World Intellectual Property Organization’s database. If the Ranger Thunder name ever sees the light of day, it will likely appear as a special edition or trim level for the truck. The global-spec third generation Ranger offered a ‘Thunder’ trim level that came with equipment like leather seats and silver trim, so this new model could come similarly well equipped. The Thunder may only appear in European markets, but with the new Ranger being a global product, it’s not impossible that we could see it North America one day as well. For reference, the Ranger is currently offered in Limited, Wildtrak and range-topping Wildtrak X trim levels in the United Kingdom, along with the limited-run Black Edition. Some updates are in store for the global Ranger lineup for 2019, including the addition of the highly anticipated Ranger Raptor, so the Ranger Thunder might arrive by as early as next year. As for the US and Canada, the Ranger is set to launch in XL, XLT and Lariat trim levels for 2019. An FX4 package will also be offered, which adds a Terrain Management System with four drive modes, a heavy gauge steel front skid plate, Dana front and rear axles and electronic locking rear end. The US-spec Ranger will be built at Ford’s Michigan Assembly plant in Wayne, MI. The new Ford Bronco is also set to enter production at the Metro Detroit site, which will share a platform with the mid-size pickup. Some Ford enthusiasts were hoping to see the Ranger Raptor arrive in North America, but it looks like we’ll have to just make do with the F-150 Raptor. Ford’s decided not to sell that model alongside its larger sibling, it turns out.